An Orthodox video evening will be taking place at St Mary’s Church, Commonweal Road, Swindon on Wednesday, 21st October at 6:30 pm. 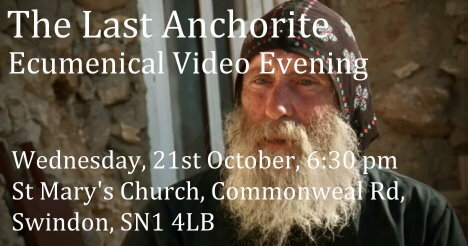 We will be watching a video called The Last Anchorite, and sharing food and fellowship as we enjoy a professionally produced presentation on this interesting and useful spiritual topic. It allows the well known Coptic Orthodox monk and hermit, Father Lazarus of the monastery of St Anthony, to speak about many spiritual subjects, offering insight from his unique perspective. Father Lazarus was an Australian atheist and university lecturer who was converted by unusual means and has become a monk of the Coptic Orthodox Church.